Halogen ovens offer a quick-and-easy way to cook smaller meals while using less energy than a conventional oven. Here we take you through some buying considerations and list the six best halogen ovens of 2018. How do Halogen Ovens work? The heat that cooks your food is produced from the oven’s halogen bulb. The heat is trapped in a covered glass or heat-resistant cooking dish. This setup is assisted with a timer, internal fan, plus simple thermostat to regulate the oven’s temperature. In tests halogen ovens cooked food 20% faster than standard ovens and consume about half the energy. Read also: Best Toasted Sandwich Maker 2018. Can a halogen oven replace my full-sized oven? Probably not. 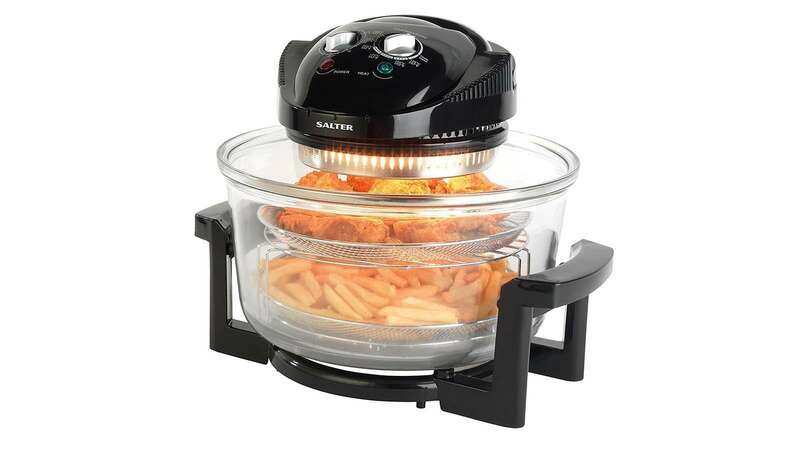 The halogen oven is designed to be a supplementary cooker. It’s size limits the volume of food one can cook. Halogen ovens are designed to be a speedy and hassle-free accompaniment to your traditional cooker. As we’ve detailed above, when you look at what a halogen oven is, it’s pretty unsophisticated device. They’re essentially mini oven that site on your worktop. however, the best halogen ovens have more advanced features than traditional ovens that make cooking easier. 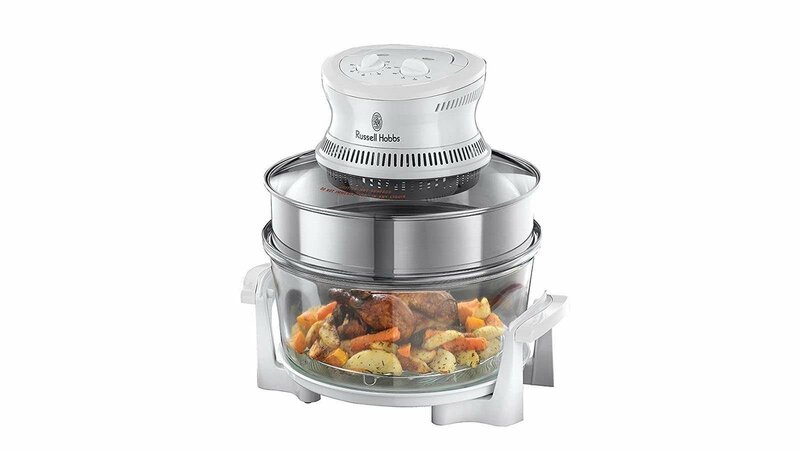 Pre-set cooking modes: Most budget and mid-range halogen oven will come with just two dials. One for temperature and one for cooking time. New high-end models offer this in digital form along with preset cooking functions. If you want the best halogen oven, look for one that comes with preset cooking modes. Self-cleaning: Technically all halogen ovens are self-cleaning. You only need to fill the units with water and washing liquid and not set the temperature too high. However, we recommend looking for an oven that comes with a dedicated self-cleaning mode as the fan, which circulates the water, is often more suited to cleaning. A machine with a self-cleaning mode gives you peace-of-mind too, meaning you can simply turn it on and not worry about the water over boiling or over bubbling. Check out our Breville VST041 Deep Fill Sandwich Toaster review too. Size: There are two things you should consider here. First is the overall unit size. Does it fit your kitchen? Next is the oven size and this is measured in litres. Here bigger is always better (providing it fits your kitchen). Attachments: The attachments that come with, or are available for, your halogen oven is as important as any other feature. The best halogen ovens come with the following attachments. Separate Rice, Cake and baking dishes. Attachments: Easy to replace halogen bulb; High rack, Low rack, Tongs, Extender ring, Rice / Cake dish; Baking / Steamer rack; Toast rack; Skewers. This Halogen Oven by Andrew James has it all. Its capacity is large enough to cook proper meals in, plus it comes with a large selection of handy attachments to aid your cooking. However, what we like the most about this product is its digital interface, complete with pre-set cooking modes. 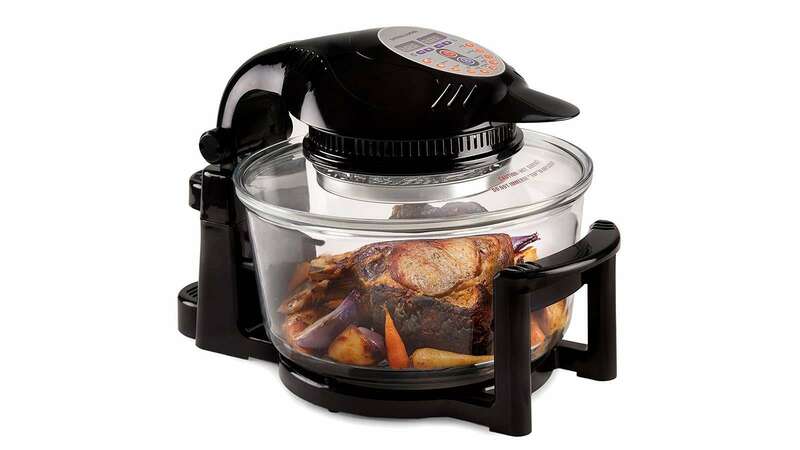 This Halogen Oven lets you cook a whole range of foods, from roasts to rice and chips to cakes. The hinged lid makes it easy for you to get food in and out whilst the oven is hot without having to hold the hot lid. This digital oven also has a 2-hour timer and adjustable temperature control dial that goes up to 250°C. When you’re finished cooking with the Andrew James, just fill it with water and washing liquid then press select the self-cleaning mode and it will automatically heat and swirl the water around until the glass dish is clean. Everything about this halogen oven has been designed for convenience. An excellent product. Attachments: Reversible rack; Stainless steel expansion ring; Rack to rest the heater on at the end of cooking. The sheer size of this Russell Hobbs halogen oven is impressive. Measuring in at 16L it’s the biggest you’re going to find on the market. It’s really simple to use too. One dial for temperature and another for the timer. While there’s not pre-set mode for self-cleaning, as there is with the Andrew James above, the same technique can be used. Simply fill the oven with water and washing liquid then turn both the heat and timer dials to replicate the self-cleaning function. 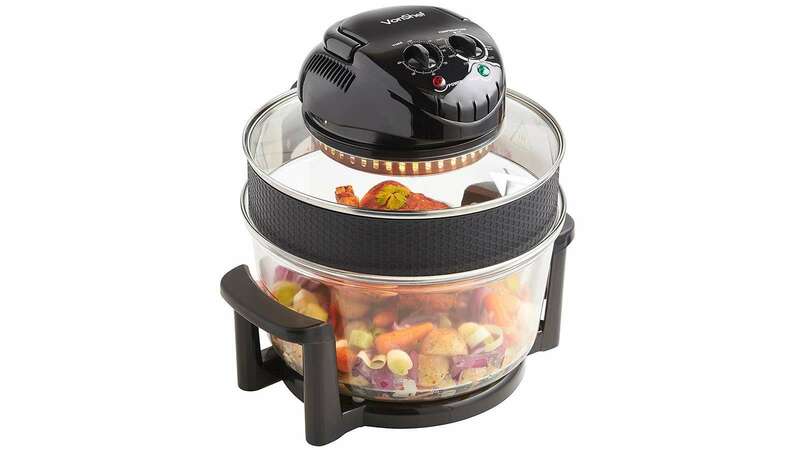 The Daewoo Deluxe Halogen Oven is another excellent product in this category. It’s easy to use and clean and comes with good attachements. However, it’s four litre smaller than the Russell Hobbs featured above and its RRP does’t really reflect that. Buy this halogen oven if space is tight in your kitchen, otherwise, spend a few more quid and get the Russell Hobbs (above). 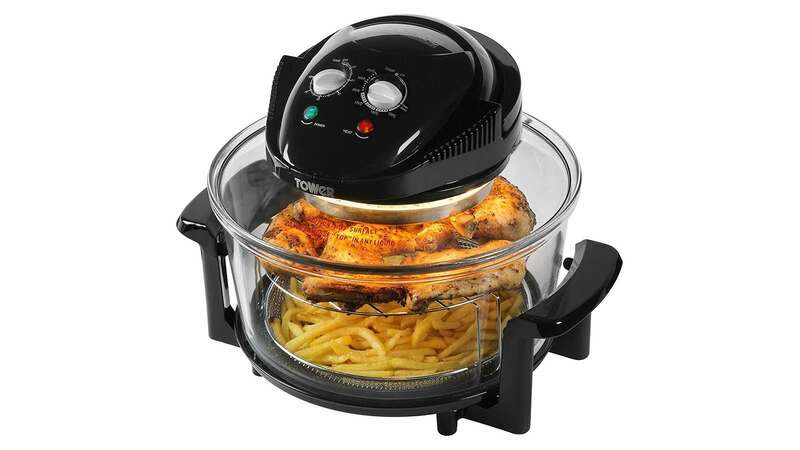 Suitable for grilling, roasting, baking, steaming, frying, barbequing, broiling, reheating & defrosting, the VonShef Premium 12L halogen oven looks great and performs even better. Like all halogen ovens its easy to use and clean and will become an essential part of your kithen immediately. Attachments: High rack; Low rack; Lid stand; Tongs; Mesh tray; Oil sprayer. With 1400 W power, it can cook your food up to 3 times faster, and can also be used for baking, roasting, grilling and steaming. The fryer has a glass dome which allows you to see the cooking process or monitor your food, and a removable bowl for easy cleaning. It comes with a high rack, low rack, lid stand, tongs, mesh tray, oil sprayer and 50 recipes, so you can begin cooking right away. If you want a fast, convenient and healthier fryer, then the Tower AirWave Low-Fat Air Fryer is a great choice. This appliance lets you make delicious food with up to 80% less fat than traditional fryers. 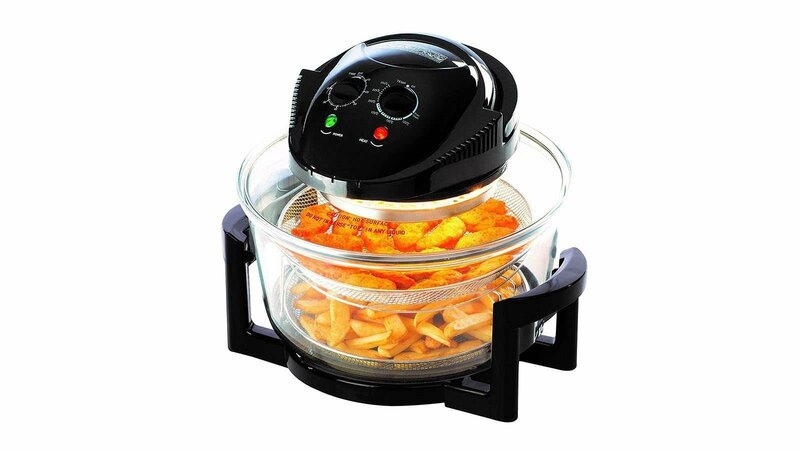 The Tower AirWave cooks your food using the heat from its halogen bulb, allowing you to use it like a mini fan-oven. Use it to roast vegetables and meat, bake cakes or cook from frozen (without thawing time). It glass dish is removable for easy cleaning and observation. This oven also comes with a 5l extender ring, which boosts the device’s cooking capacity to 17l. Read next: Best George Foreman Grill 2018.